Posted by claireblang in Drivers, NASCAR, Teams, Trackside. Image via Wikipedia Hi all – Welcome to Bristol Motor Speedway! Sorry I’ve not blogged more – these two days are, seemingly, the fastest in motorsports. Thank you for all your kind emails and instant messages. I wish that all of you could be here to be a part of this race event. It’s one of the special races on the circuit and the fans are charged up – but with the two-race, two day schedule it’s fast paced. I just got back from the Wypall stage where I emceed interview sessions with crew chiefs from across the Sprint Cup Series and in between I went up to emcee Chevy hospitality with Regan Smith (starts 4th) . I have to say I’m impressed with that kid. He and I talked about how he needs a nickname to differentiate him from David Ragan (starts 27th) and he told me that a couple of his team guys were working on that but they haven’t come up with it yet. I told him maybe my listeners could help – he liked the idea so start thinking. His middle name is Lee by the way. I have had emails from some of you looking for information on the announcement today on the fourth driver for RCR – so here are the details. BRISTOL, Tenn. (Aug. 23, 2008) — Richard Childress Racing announced today that Casey Mears will drive for its No. 07 Jack Daniel’s® team and Clint Bowyer will move to its new No. 33 Cheerios®/Hamburger Helper® team for the 2009 NASCAR Sprint Cup Series season. With focus on having all three current RCR teams making the 2008 Chase for the Championship, RCR will continue its on-going process of evaluating team performance throughout the year to determine the crew chief, engineer and crew member lineups for the 2009 season. ears will join RCR for his seventh season of NASCAR Sprint Cup Series competition. 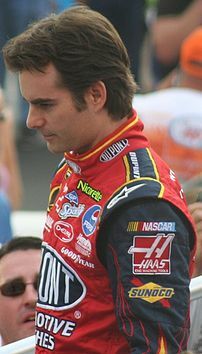 The Bakersfield, Calif., native earned a dramatic victory in the 2007 Coca-Cola 600 at Lowe’s Motor Speedway and also has three poles to his credit. Jack Daniel’s® has been a primary sponsor partner of RCR since its first year of involvement in NASCAR in 2005. The Jack Daniel’s Distillery, located in Lynchburg, Tenn., is the oldest registered distillery in the United States and is on the National Register of Historic Places. Bowyer, the current leader in the NASCAR Nationwide Series point standings, made his Cup Series debut in 2005 and has been with RCR since 2004 when he ran a partial Nationwide Series schedule. The Emporia, Kan., native has earned two victories and two poles since being named the full-time driver of the No. 07 Jack Daniel’s Chevrolet for the 2006 season. “I’m proud to be joining the General Mills family,” said Bowyer. “Cheerios and Hamburger Helper are brands my family and I grew up with. General Mills is a great sponsor and has been in NASCAR for many years. I look forward to driving the Cheerios/Hamburger Helper Chevrolet Impala SS to victory lane. The 2009 season will mark General Mills’ 13th year of sponsorship involvement in NASCAR. Based in Minneapolis, Minn., General Mills is one of the world’s leading food companies. It was an interesting news conference. Clint was most positive about giving up the Jack Daniels sponsorship for General Mills – but initially it seems hard to associate Bowyer with a cereal and easier to associate him with Jack Daniels. Boyer is a team player, that is obvious, and he understands that to have a sponsor and a ride with RCR is something that is enviable and that there are many racers across the country who would trade places with him in a skinny minute. Bowyer gets this – and he’s doing what he’s been asked to do for the good of RCR. Knowing Richard Childress – he won’t forget it. Posted by claireblang in 2008 Season, NASCAR, Teams, Trackside. Shenanigans. Under a full moon here in the Irish Hills after the Nationwide Race on Saturday – A poor decision was made to try to withhold accurate numbers from NASCAR by manipulating the dynamometer testing on the #20 and #18 Joe Gibbs Racing teams . Who did it, for what reason and how they should be held accountable has been under great discussion since the Sprint Cup garage opened here today. Everyone here has been talking about it and the bottom line is that because of it JGR and Toyota (by asssociation) have egg on their faces and NASCAR is not happy. The investigation is under way – and if what NASCAR thinks was done (using a magnet to hold back the throttle) it is likely severe penalties will be handed down from NASCAR and JGR next week. Q: To follow up on the last part you said – do you have any idea how high it goes and is there any possibility that heads will role and you’ll have to fire people? Q: We’ve been trying to remember – you guys don’t usually get caught for doing things. The last we can remember was when the 20 car was taken back at Texas. So is that particularly distressing because you have such a good reputation within the garage? Q: This was not in place for the race only during the dyno test? Gibbs: Yea. And thankfully not in place during the race because what it did it definitely lowers your horsepower so for us it was just after the track thing trying to – and NASAR has been taking that down to the track for quite a few years now so to my understanding – I don’t know what it exactly was- a piece placed there to kind of show less horsepower than we’d normally have and the intention was to either to say hey you hurt us worse than you thought or whatever I’m not sure. Either way it came out the wrong way. Q: I believe your teams have 14 wins in the series this year. Do you believe this stains any of those wins? Gibbs: “Yea I would say if it was an on track thing it would definitely stain them but being an off track things and trying dinking around with the dyno personally I don’t see how it would affect those wins there but again hey it’s still a serious issue with NASCAR even if it is off the track working the dyno so there was no reason for that. Q: Have the individuals or individual involved who committed this transgression stepped up and said it was me. Have you identified who it was? Q: Have you had a chance to talk to Toyota about this to gauge their reaction? The anthem is playing now. I need to go to the grid. More of this transcript coming up later when I get back in. Posted by claireblang in 2008 Season, Drivers, NASCAR, Trackside, Transcripts. I’m here in the media center at MIS. I promised I’d post a transcript of what Jeff Gordon had to say when I asked him the questions you have been asking me on air and in email (insidercbl@aol.com) about his team’s performance which has not been catastrophic yet -but not up to tradition especially at specific tracks where his fans expect a ray of light. As always, which is a great thing about Gordon, is that when I went searching of an answer – he was open to answering a lot of questions – and for a man who is 6th in points headed into this race I don’t think that he’s in a crisis position. “Never rule Jeff Gordon out,” is what everyone in the garage, from his teammates to his fellow competitors will say when asked and I agree. But with so many callers asking me and wondering what I think I felt it was time to go ask him. You know it’s not like me to answer for the driver -I’d rather go ask him so that I’m fair and not making up as I go along with what I think he’d say. Jeff answered everything and it was helpful (see post below). When I told Jeff that some of the fans feel that a champion like him should be able to drive through an ill handling race car – compensating for the lack of handling despite the challenges he didn’t want to comment. That ,he said, was best reserved for the way that the team handles issues which is internally. Later in the transcript he explained why. Gordon is not the type to slam his team – nor does he want to be lectured on how to drive a race car – not by the fans and not by anyone. I don’t blame him. No one except the guy behind the wheel, least of all the well intentioned who are fans of his, or not, but have never driven a race car or his race car. CBL: LATELY I’VE BEEN GETTING A LOT OF CALLS ABOUT EITHER STEVE (LETARTE) OR YOUR PERFORMANCE, IT’S REALLY YOUR FANS THEY LOVE YOU BUT THEY ARE GETTING UP ON THE EDGE OF THE WHEEL, YOU KNOW WHAT I MEAN? “You got to love them for that but at the same time it’s a competitive sport. We focus on everything from how internal communication is, how people are doing their jobs. If making a change was going to fix it then there might have been changes, but that’s not the issue. I think Steve Letarte is doing an awesome job. I feel like last week was not a great performance for us. We’ve had that happen this year. It’s just been one of those years. I believe in what we have. There’s areas where we’re looking to getting stronger and better. The fans have to just be patient and I remind everybody of what we did last year. CBL: HOW FAR OFF YOU? THEY SAID THAT YOU DON’T HAVE TO BE FAR OFF TO BE WAY OFF. “Not with this car. You can actually have a good car and just lose track position and be done. That was a combination of what happened to us last week. We weren’t very good there at the beginning on the long run and then we had the radio problem. We lost a lot of track position and it’s just so hard to make it up. We didn’t have enough cautions to work on the car. REGARDLESS OF YOU ARE FINISHING POSITION, WHEN YOU GET OUT OF THE CAR SUNDAY WHAT DO YOU NEED THAT WILL MAKE YOU FEEL LIKE YOU ARE MAKING PROGRESS AND HAVE SUCCESS ON SOME OF THESE BIGGER TRACKS? “I think that it’s being able to get to the front. I feel like if you’re talking about us being in championship position we got to go out there and lead a lot of laps and being in contention. It doesn’t necessarily mean we have to win the race which we do need the bonus points. We need to be out front, competitive, contending for the lead and then plan the pit strategy right. All those other things have been good for us, pit stops, communication and the pit strategy. We just lacked a couple of things, track position. YOU SAID YOU DON’T STOMP AROUND. IS THERE EVER A TIME WHEN THAT MIGHT BE NEEDED FOR A TEAM? So, that’s what he’s saying. He’s cool as can be – no sense of stress or lack of confidence that the team will figure it out. I have talked with the team and they are confident that they will find the answers and rebound because that is what this team does. My guess is that they will be ok – they have too good a driver and too many resources not to get over this speed bump. Back with more later…I wanted to get this up and to you since I promised. Hope all of you are enjoying the weekend. The weather is exceptional here. This is such a beautiful part of the country. Hey Race fans! To kick off today’s blog I wanted to tell you something on a note that means a lot to me personally. Every kid feels that his or her dad is a champion – and that he is a super hero that can go longer, faster and farther than the dad of the other kids down the street. In my case this is true. As the Olympics kick off today in Beijing – I’ll have a special feeling of pride in my heart for my dad who will be watching with special interest in what the Olympics stands for. 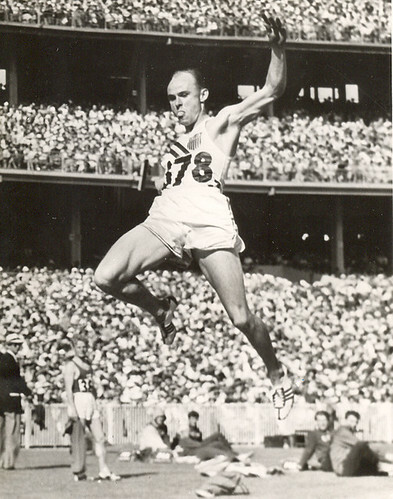 My father, John Bennett, earned a medal in the 1956 Olympics in the long jump. He is a two-time NCAA champion from Marquette University (graduation class of 1954), a National AAU champion, double winner in the Pan Am Games of 1954 and a Silver medallist in the Melbourne Games of 1956. Best jump of 26′ 3 7/8″ (8.01m).) Of course, if this is all that he had done in his life – he would already have accomplished achievements worthy of worldwide acclaim by many. To achieve at that level takes the ultimate in focus, and commitment to hard work and excellence. A God given gift doesn’t make an Olympian – it’s the training and desire to achieve at the highest level and the desire to put in the kind of hard work that makes some rise to the highest level of achievement. But the Olympic medal is not all that John Bennett achieved in his lifetime. Far from it. My first father died when I was three years old – and when John Bennett came back from the Olympics he met my mother, married her, adopted us three little girls (I was three years old) raised us as if we were his own (which we were)- and set out to become a world-class medal winning father. Together, my parents had a boy, Brian, who would carry on the Bennett name. If you ask why I carry the B. in Claire B. Lang it is in honor of the Bennett father who I was lucky to get – and a man who inspired me to work hard in life and to do things to the highest of my ability. I never knew another dad and so to me John Bennett is my dad – and has been as long as I can remember. So, as I watch the opening ceremonies and see what pride the athletes have in representing their home country and in knowing that they are the best in the world I think of the pride I have in what my father accomplished on and off the track. In life, it’s what do after you win the medal counts so much – and I think about the pride I have in what he accomplished and I also think of the influence he had on me and how I ended up in life. I love the Olympics, I love watching them and at the very same time, back at home in Wisconsin, there’s a really cool guy who will be watching with special pride. I wanted to salute him today.